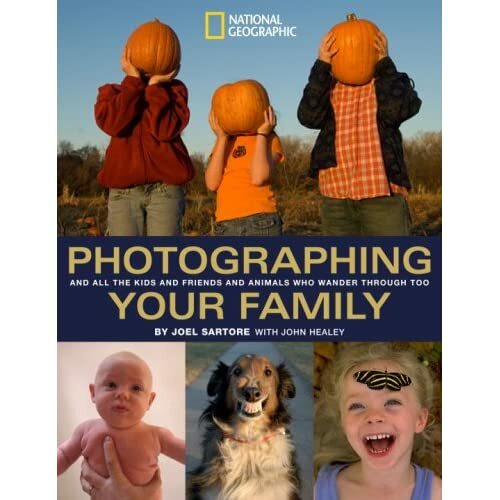 Photographing Your Family: And All the Kids and Friends and Animals Who Wander Through Too (NG Photography Field Guides) by Joel Sartore with John Healey has a couple of paragraphs about makingbooks.com and my belief in the value of making books with children in the chapter on Printing, Displaying, and Storing Your Photographs. Joel Sartore is an acclaimed National Geographic photographer. Although he has traveled the world, his favorite subjects are his family at home. He has definite ideas about what makes a good photograph with a particular feeling for crying babies (But it's the pictures of kids crying that remind us what is was like to be a parent with young children. They're entertaining and they're emotional. And that's what a good photograph is: It is a picture with good light, a clean background, and some emotion). I particularly like that he puts emphasis on photographing daily life as well as trips and special events. Joel Sartore is someone for whom photography is a way of the life and the camera seems like an extension of his body. The book is illustrated with his photographs of his family accompanied by his comments which include why he likes or doesn't like a particular photo, what he was thinking at the time he took it, and comments about composition and light. He uses digital cameras and gives lots of clearly presented technical information. While I think those with a certain level of comfort in using their cameras will get more from the book, there is much to offer at all levels. Because it is amply illustrated and well-designed, it is a pleasure to repeatedly leaf through the pages. I have found that I have been able to absorb something more with each viewing.